Those tiny quiet moments we used to enjoy at stop lights, commuting on trains, and waiting for appointments are gone and now replaced with quick glimpses of emails, text and social media. Sadly, even social media has become a social obligation with instant messaging and twitter protocols – sigh. There just isn’t any time left over for you know who anymore is there? Well, there is….if we’re strategic. I used to think my self-care could wait nine months from now when I might take that maybe vacation, then I realized I wouldn’t make it in one piece nine months from now if I didn’t get myself together. I just ended a 6-week program with 230 from women around the world. During these six weeks, I can usually surf the waves of chaos, but this round I was ending a relationship at the same time, and after forty days, found myself crashed into total depletion. My adrenals were shot, I looked like hell in the mirror, and my usually sound sleep became fitful at best as I ground my teeth nightly. So as a last resort, I got back to basics and started walking my own talk. Self-care doesn’t take a lot of money or even a lot of time. Self-care simply takes a commitment on our part to follow through. I found myself actually scheduling in my calendar tiny bits of moments to accomplish just a few things that delivered big results. Here’s how to fit self-care in during times of chaos (which seems to be every day in this wild world). The best news of all? None of these suggestions require any real additional time on your part, only the commitment to do them. Leave your cell phone in the back seat or stashed in your bag while you commute. If you can’t reach it, you won’t read it. Believe it or not, just a few minutes of space-out time allows your nervous system to relax. The average person looks at their cell phone 150 times a day – that’s every few minutes. Driving or commuting without it allows us to look around and take in the world. When I realized I was on maxed-out overload, I did this practice and found myself people watching, looking at the sky, listening to music, and simply letting my mind wander free for a few minutes. Those few minutes added up to big time peace. Promise yourself to turn off your phone and computer ninety minutes before bedtime. The New York Times wellness section reported studies have shown that electrical devices mess with brain chemistry and hormones leading to disrupted sleep. I forced myself to step away from everything electrical before bedtime and instead pulled out a book to escape for a little while. Most nights I drifted off to sleep with the book on my chest and didn’t wake until morning. The act of disconnecting and allowing my brain to enter fluff time as I call it, allowed me to sleep deeply. Have a bath or two or three during the week. If you’re like me, a quick shower followed by an even quicker slather of lotion in the mornings is about all I get during times of chaos. When I realized I was maxed out, I started running a bath and tossing a handful of raw coconut oil in. 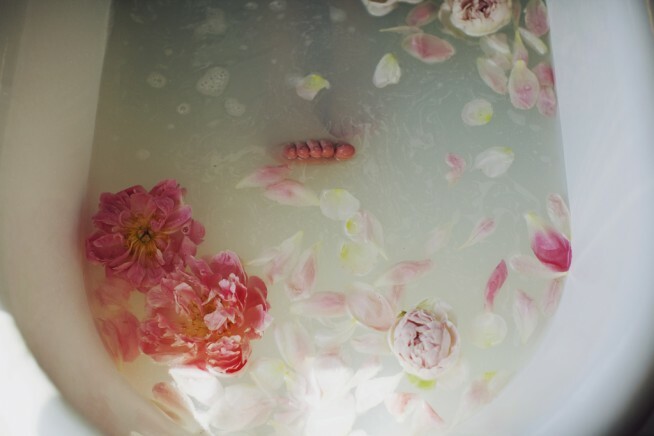 I got so addicted to the peaceful blissed-out silky feeling I felt as I crawled into bed that I started replacing my morning shower with a bath a few times a week. Submerging ourselves in a hot tub of water instantly awakens that primal feeling of safety in the womb. There’s no way to remain tense when we’re submerged up to our necks in warm comforting water. Add in a candle or two and some cucumbers over your eyes and you’ve got a spa experience without the cost or time commitment. We may not be able to choose our family members, but we can choose our friends and clients. When we’re maxed out we don’t have a lot of energy to give. It becomes super clear who the takers and suckers are in life. What’s the difference between a taker and a sucker? Well, let me start with the common trait of both: they are draining YOU. Takers will allow you to give to them, listen to them, assist them and entertain them without giving anything in return. They don’t ask about you, nor really care. Suckers behave like an octopus sipping your life force energyslowly and steadily. They’re harder to spot but easy to feel if you’re tuned in. Ask yourself: how do I feel before seeing, talking or even emailing and texting this person, and how do I feel after? Have you ever felt great in the morning, only to realize by afternoon you’re out of sorts? Chances are you’ve picked up on everyone around you and you’re carrying a big load of negative energy. How to decontaminate yourself after being smeared by negative energy? Take a shower when you get home. Get a sweat on with a workout at the end of your day. Go for a walk in nature. Soak in a bathtub with a cup of sea salt. Dance. Anything you can do to move some energy will restore your own body to you again. There used to be times I’d be in corporate meetings all day and slip into the restroom to just shake all over like a dog. Then I’d run cold water over my wrists and return to the meeting feeling energized and peaceful again. I know it sounds crazy, but like I always say to my program participants: sometimes the one thing that sounds the silliest might be the key to set you free. We’ve got to step out of the norm if we want a change. Spending time in nature isn’t a luxury, it’s a necessity. When we’re outside, regardless of weather, we tune into most all of our senses at the same time. Looking around, smelling the air, feeling the sun or the cool crisp air, and hearing the sounds around us brings us into the now moment. The now moment is where peace resides. My personal 5-step survival formula during these times? I bought an old fashioned day planner and scheduled self-care in as though I had appointments I couldn’t cancel. I made time each day for a bath, a walk outside and a workout of some sort. I also started each morning with a short meditation. It wasn’t rocket science, but it did leave me with mind blowing space for peace. At first I doubted I’d have time for any of it, but as I followed through, I found I had more energy and better clarity to get what needed to get done, DONE. I was more efficient, had more energy and felt balanced within three days of this practice. I was more efficient, had more energy and felt balanced within three days of this practice. So, now I want to hear from you. Let me know three things you’re committed to doing for yourself in the comment section below. Let’s peace out together.